When forced into a survival situation, Mother Nature can provide a variety of different resources. Many people see nature as the enemy in survival, but the right attitude is to see it as your ally. Fighting against nature is a losing battle. However, working with nature can give you the tools you need to survive any situation. The sun happens to be one of those tools. While the rays of the sun can burn your skin and cause dehydration, they also can help with your survival efforts. Knowing how to use the sun can be an excellent asset to get you through your ordeal. In this article we will cover different ways that it can help you in a survival situation. Dehydration is the second most common reason why people die in a survival situation. This is mainly because most water in the wild is not suitable to drink without getting sick. Fresh water is commonly filled with bacteria and pathogens that can cause vomiting and diarrhea. Drinking tainted water can end up causing even more severe dehydration in the end. When you have no other option, ultraviolet light can kill most bacteria and microorganisms. For this to work, there are several factors that must be in your favor. The bottle you use must be plastic and cannot have any tint or coloring. The water must be crystal clear as murky water will block the ultraviolet rays that purify your water. You also need a sunny day and a spot where direct sunlight will hit the bottle all day. To ensure that the water is purified, it should sit in direct sunlight for a minimum for six hours. The more time it is exposed to sunlight, the better chance you have of avoiding waterborne illness. There are often situations in which you need to cook food but do not have the elements needed to build a fire. Solar ovens can be a great way to handle this situation. These are containers with reflective surfaces that focus the sun’s rays on a food rack and hold in the heat to cook your food. As is with most solar projects you must have direct sunlight, so cloudy days will not work. You can purchase a solar oven for the most efficient option, or you can make your own. To construct your own you will need a cardboard box such as a pizza box. Cut a flap out of the lid and line the inside of the flap with aluminum foil. Then tape plastic wrap across the opening. Line the inside of the rest of the box with black paper and place your food inside. Adjust the foil flap so that the sun shines directly through the plastic wrap and onto the food. The plastic wrap creates a greenhouse effect while the black paper draws in the heat and light. 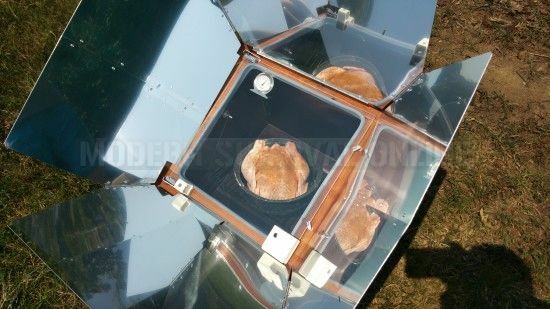 Keep in mind that most DIY solar ovens will not reach temperatures higher than 200F. The solar ovens you purchase can get as high as 300F with the right conditions. This means it is your best bet to cook foods that are unlikely to make you sick if undercooked. These would include reheating precooked foods like soups or hotdogs. Getting things crispy is tough at these temperatures, and you should avoid foods like raw chicken that carry bacteria. There are several different ways that the sun can help you start a fire. Once again, conditions must be perfect for this to work properly. You must have bone dry tinder, and it has to be fluffy and fine in consistency for magnified light to ignite. The easiest way to start a fire with light is using a fire lens. This is a convex lens made of glass or plastic that can focus sunlight onto a small focal point. This point should get hot enough to ignite tinder if you have direct sunlight. You will have to adjust the position of the lens to get the smallest focal point possible. Another common light fire-starter is a concave reflective device. This collects light and reflects it back to a focal point in the center of the device. Normally a metal arm allows you to put a small amount of tinder at the perfect focal point. You simply place your tinder in the device and then point the device at the sun. Within a few seconds you should have an ember that can be coaxed into flames. If you do not have these fire-starting devices, there are several other pieces of gear that can be broken apart for the right elements. Flashlights normally have a concave reflective piece that can be used for fire. Often times you will find convex lenses in binoculars, cameras, or even eyeglasses. If you get creative, you may find exactly what you need in the other devices you have with you. There are times you can make a convex lens if you have no other choice. Glass and plastic bottles filled with water can sometimes be positioned to give you the focal point you need. Condoms or plastic bags filled with water can accomplish the same thing. Even a clean block of ice can be shaped with your bare hands into a lens and positioned to acquire a focal point. One piece of garbage that can be used for a concave reflective device is an aluminum soda can. The bottom can be polished with chocolate or wax to create the shine needed to start a fire. Moisture in food is the enemy of preservation. Therefore, the best way to keep meats and other foods for storage is to completely dry them out. The rays of the sun can help you do that. 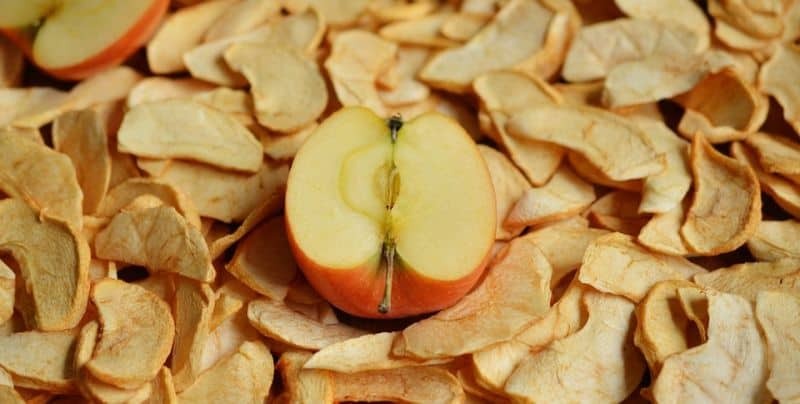 For any food that you wish to preserve, it needs to be cut very thinly and then dried on both sides. Each piece needs to be less than 1/8 of an inch. In addition, salt and spices can help draw moisture to the surface so the food dries faster. Without a heat source, drying food in the sun will take several days. You can hang the food from cordage in a sunny, breezy spot or you can build a drying rack on which to place you food. The breeze is important as it will help keep insects away from the food. You may also want to raise the food up high enough that wild animals cannot get to it. To check if your food is done drying, check for any signs of moisture on the surface. It should be stiff to where it splits when bent but does not break apart. You want it to be just short of brittle. If you get the right level of dehydration, this food can be stored for weeks or even longer if it stays dry. It works for meat, fish, and even fruits. I know it seems obvious, but the sun is vital in staying warm in survival situations. It is a good idea to consider the sun when picking a location for your shelter. Locations on the West and South side of a hill or mountain will always be warmer. You also may want to consider a shelter out in the open versus one in the woods where the sunlight is blocked by the canopy. There are times in survival scenarios where the sunshine in the morning is what pulls you away from the edge of hypothermia. The sun is also vital in keeping you dry. Wet skin drops in temperature 20 times faster than dry skin. If you get wet, hanging out your clothes in a sunny and breezy spot can get it dry again. At the same time, the sun can quickly dry off your skin so it is tolerable to wait for your clothes to dry. Sometimes a little sunshine is all you need. In the past few years, the prices of solar powered devices have dropped significantly. One of the most popular is a simple solar-powered battery. I have one myself and use it all the time. This battery can help you recharge a phone or any other portable device. There are also flashlights and radios that will use the power of the sun to charge their batteries. One of the best ways to signal for help is to reflect the rays of the sun back a target. There are inexpensive signaling mirrors that are perfect for this task. For this type of signal you cannot be located between the sun and your target, but otherwise they have a sighting hole in the center to help you aim your bursts of light. You can also sometimes use the reflective side of an emergency blanket to signal for help. When it seems like everything around you is trying to kill you, it can be hard to keep your spirits up. If nothing else, a bright and sunny day can give you the little hope that you need to keep pushing. Never underestimate the power of the sun and be ready to use it when the time comes.